I've been in the ministry for more than fifty years. Yet I never cease to be surprised or disturbed (perhaps "outraged" may be a bit more accurate) when ministers and theologians attack Israel. When I say to my friends or colleagues, "Can you believe this? ", I'm sure some of them are thinking, "Hal, just accept the fact that the world hates Israel!" I do accept that. But what I never can accept is that the Church hates Israel! Well, certainly not the whole Church, but large portions of it. This should come as no surprise to those of you who regularly watch "The Hal Lindsey Report." But on the other hand, like me, it probably does continue to surprise you if you love Israel and think all other Christians do, too. Not true. In fact, there are large numbers of Christians, including many in liberal Protestant denominations, ministries, ecumenical associations, and para-church organizations that virtually despise Israel and what she stands for. And that number is growing. And what's worse is that it's growing within Evangelical ranks. Of course, you've heard me address this topic before when I've discussed the growing "Replacement Theology" movement. If you recall, those who promote "Replacement Theology" think that God reneged on His unconditional covenant with Abraham, scrapped the promises He made to his descendants, the Jews, and bestowed them upon the gentile church. So, when you read about the promises made to Israel in the Bible, you just replace "Israel" with "the Church." Never mind about the curses and judgments God pronounced against them. Apparently, those don't count. I'm sorely tempted to label that a crock of lies, but I'll restrain myself for the sake of decorum. I will point out, however, that to believe that proposition is to essentially call God a liar. You're probably asking yourself, "Why is Hal bringing this up now?" Well, in just a few weeks, a group of church leaders and theologians—the majority of them from the United States—are gathering in Bethlehem (Judea, not Pennsylvania) to do one thing: demonize Israel. 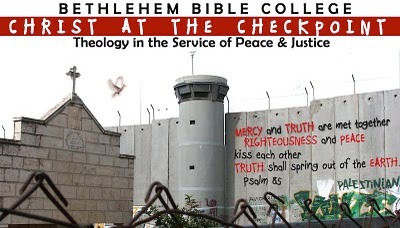 Their effort to de-legitimize the nation of Israel and, as a bonus, the Christian Zionism movement in America will take place under the guise of a conference entitled, "Christ at the Checkpoint." The group has the audacity to state that they hope their deliberations will cause many of us American Christian Zionists to reconsider our position and "seek a proper (my emphasis) awareness of the issues of peace, justice, and reconciliation." But they give the game away when they refer to Israel as an "illegal regime" and say that it has "reached a level of almost unimaginable and sophisticated criminality." Further, they don't make me feel all warm and fuzzy when they accuse many of us of being "accomplices in crimes against humanity, such as the crimes of apartheid and persecution..." by supporting Israel's right to exist. And just to make sure that we Christian Zionists understand where they're coming from, they say our beliefs are "a crime and sin as defying the core of the Gospel." Well, that sure makes me want to donate a few bucks to the cause. How about you? Seriously, though, to have a group of Christian ministers, theologians, and church leaders (some of whose names you may recognize) travel to Israel and declare to the world that the Jews are NOT God's "chosen people," as the Word describes them, but, rather, bastards and impostors (my words, not exactly theirs, but certainly their implication), is a bit unsettling. Wouldn't you agree? Further, to hear them proclaim that the land of Israel is not the Jews' documented inheritance from God, but belongs to the Palestinians (who are, as Newt Gingrich recently described them, an "invented" people), drips of heresy. Can you believe this? Oops, there I go. Well, you don't have to have a Ph.D. to guess what I'll be discussing on this week's program. Of course, I'll also give you some further background and other details. I'm sure you'll hear a lot that you need to know for future discussions with your friends, family, and colleagues.